There's little reason not to love the solo project of Michigan's Keith Latinen. Empire! Empire! (I Was A Lonely Estate) echoes twinkly bands of the 90's into the present and ceases to amaze with sounds so very reminiscent to Mineral and American Football that you can taste the bittersweet melancholy on the tip of your tongue when you pop in the band's solo full-length effort What It Takes To Move Forward, or anything else they have out, for that matter. More importantly, though, it seems the band actually does understand what it takes to move forwards (horrific, but it had to be said), as their Facebook page details news for their sophomore album, which was officially started on April 8th. Hopefully this means we'll be receiving LP2 from the great folks in Empire! Empire! sometime in 2013, finally closing their now four year gap between full releases, but delicate care produces great results, and more often than not, the wait is worth it. With such talented and good-spirited folks in the band, the album will be nothing less than incredible. While you eagerly await any more news on Empire! Empire! 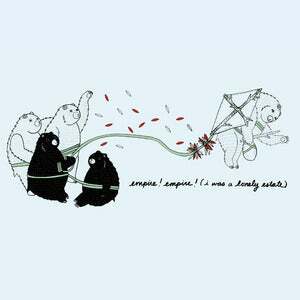 (I Was A Lonely Estate), you can listen to their discography for free on Bandcamp. Also, be sure to order the repress of When The Sea Became A Giant. Finally, be sure to check out the Count Your Lucky Stars Facebook page for details on how to download Empire! Empire! 's entire discography for free next week!